To make your amazon website be an attractive, and increase your earnings, I will share plugin and tips to create amazon custom thumbnail plugin. For you that use free wordpress theme for selling amazon’s products, Amazon custom thumbnail can be your first choice to build a your amazon wordpress site. Features that we get when using amazon custom thumbnail plugin. Display the rating of products. Display the List price with strike tag. Display the price of products. Display Add to cart button ( will link to the amazon site add cart form). Okay, time for us to review step by step how to create amazon custom thumbnail plugin. If previously I have made asin grabber plugin, this is my second plugin. I more satisfied using my own plugin rather than buying a plugin with an expensive price. Besides being able modified to suit our taste, can also add to our knowledge about wordpress plugin and we can sell it. For build this amazon custom thumbnail plugin, i choose DW WallPress as theme. Maybe you can choose the other free wordpress themes for wallpaper’s site. Create new folder as act_amazon_custom_thumbnail. Write this script at act_amazon_custom_thumbnail.php. Description: Create an attractive thumbnail display for your amazon affiliate sites. Create new folder in the act_amazon_custom_thumbnail folder and give name as images . Finish and compress your act_amazon_custom_thumbnail folder into zip format . For create WordPress plugin , PHP file must contain a standard Plugin information header. This header lets WordPress recognize that your plugin exists. Create add_filter hooks and apply to post_thumbnail_html function ( Output HTML for the post thumbnail meta-box.) and callback act_amazon_custom_thumbnail function when the custom Filter is applied. (read more here for more information). Create function act_amazon_custom_thumbnail( $html ). In order to executed the script besides the post page and attachments page, we need statement if(!is_single() && !is_attachment() ). Create custom field parameter to save your amazon thumbnail data with this syntax below. add_action( ‘publish_post’, ‘act_add_thumbnail_id’ ) , Function act_add_thumbnail_id will applied when you publish your post (or click publish). add_action( ‘save_post’, ‘act_add_parameter’ ), Function act_add_parameter will applied when you create new post (or click add new post). azon_image : fill this custom field with your image url. azon_price : fill this custom field with price. azon_url : fill this custom field with url of amazon product . And don’t forget to include your amazon associate tag. 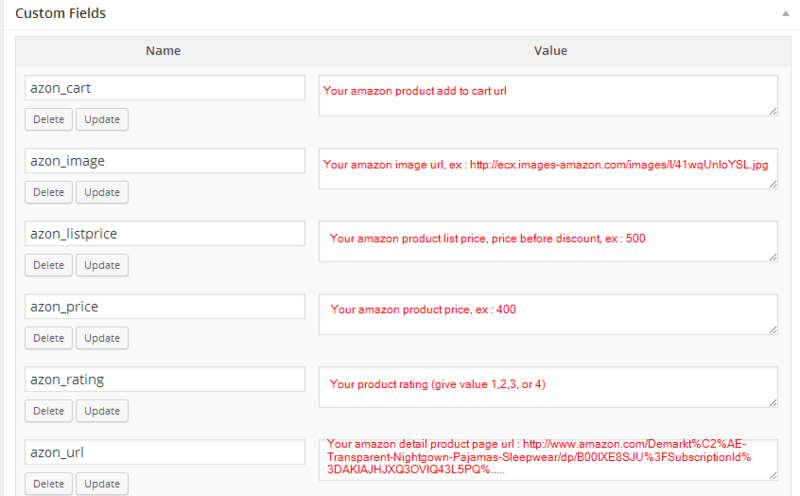 azon_cart : fill this custom field with url of amazon cart link. azon_listprice : fill this custom field with listprice before discount. azon_rating : fill this custom field with rating (give value 1,2,3,4). For set featured image on your post, we need insert post meta with key “_thumbnail_id”, give the value -1. Go to plugins ->add new, upload and then install and active that plugin. Then create new post, active your custom fields screen. Fill custom fields below the post box.